We got in touch with one of our most illustrious alums, Joe Lacey, to ask what he was up to. Joe works for the biggies: Mattel, Fisher-Price, Crayola and PEZ. He’s done packaging, books, magazines and ad campaigns in America and Europe. His sci-fi art is included in Spectrum Books’ “The Best in Contemporary Fantastic Art,” and he has won awards from The Society of Illustrators and The Art Directors Club of Philadelphia. A recent project, above, is “The Happy Electropop Music Machine ” by Jean-Jacques Perrey & Dana Countryman. Joe says he wanted to capture the look and spirit of electronic Moog music, first popularized in the 1960s. 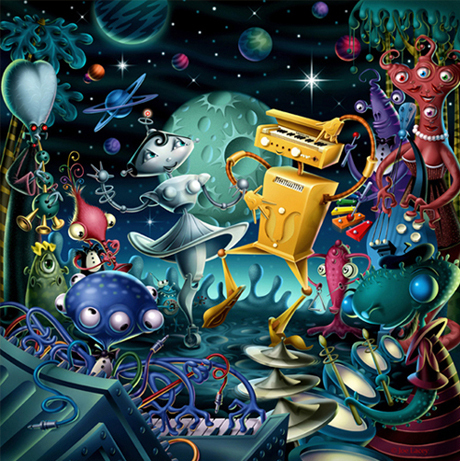 The robot is based upon the Ondioline, a French piano-styled synthesizer made famous by music legend Jean-Jacques Perrey. It was commissioned by Perrey, himself, for the CD. Joe grew up in Sayre, PA. After earning his BFA in C. D. from Kutztown in 1988, he went on to get an MFA from Syracuse. He taught illustration at Kutztown during the 1990’s before moving to California. He lives in Los Angeles with his wife, Darlene, and his dog, King. 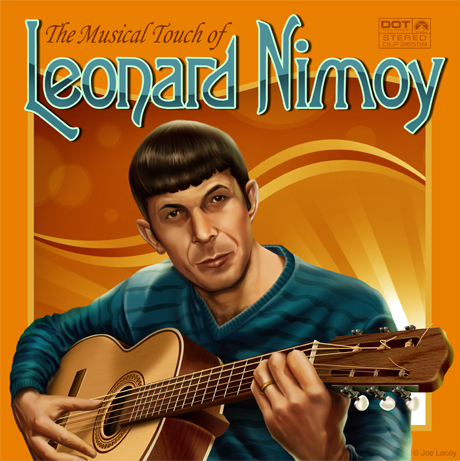 Leonard Nimoy was created digitally for www.maidenwine.com. This is a good example of both technical drafting and “digital hand painting.” The guitar incorporates both manipulated vector art and textures. The figure is hand painted digitally with the use of a Wacom tablet. Joe’s versatility is evident in his wide range of projects from science fiction art, toy packaging, and kids’ activity books. To see more artwork, or to purchase giclée prints,visit: www.joelacey.com.